I suppose the hangover was a small price to pay. November 1st marked my 42nd birthday. 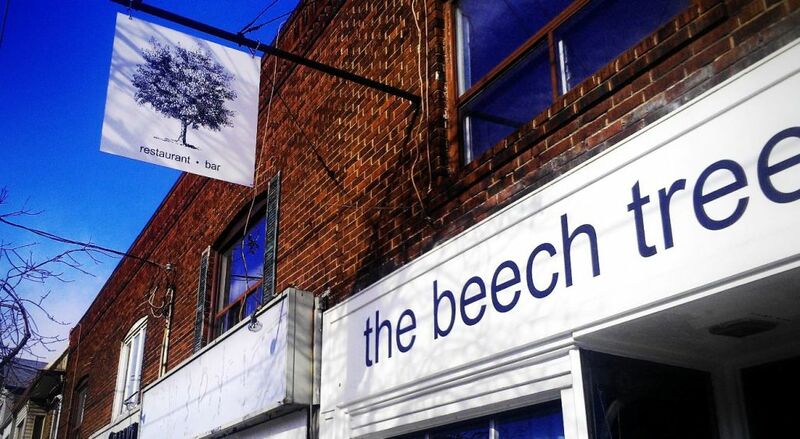 It was also a week shy of the Beech Tree’s first birthday (we technically opened on November 7th, 2013). We are both a little bit older, and hopefully a little bit wiser. This past Saturday, as a slightly self-indulgent exercise, I decided to combine the two milestones and throw a party. And what a party it was. A packed dinner service was followed by an out-of-character-for-the-Beech-Tree shindig that included infectious chops from rock-a-billy masters, The Greasemarks. (How such young guys can nail such old music is beyond me.) I took the stage, a little bit over confident from drink (and likely somewhat wobbly), and banged out a few old favourites accompanied by the rhythm section of the band (including a retro-awesome stand-up bass). Our city counselor joined us for the event. Chef pumped out some amazing canapes and charcuterie platters. People danced and hooted and hollered and the night went way longer than is typical for our quiet little restaurant. A short film of the event is currently being edited. As for my inclusion in the film cut, I will have final say on whether my performance was dynamite or detriment to my reputation. I wasn’t sure if I wanted to write a year in review of a small restaurant. Much of it would include stress, more stress, high highs and low lows. Perhaps it would be a walk down a particularly lane of memory that is best left alone, but then again, all the lessons learned and the pure adventure it’s been may indeed be worth jotting down a note or two. Owning a restaurant is nothing like what I thought it would be. It looks so easy on television. Chef Mario Batali seems so happy. Gordon Ramsay is filthy rich. I watched programs such as Kitchen Nightmares, Restaurant Impossible and Restaurant Take Over and found myself nodding my head smugly along with the tsk-tsking of Robert Irvine et al. I felt I knew better than the hapless subjects of the program. “You’re menu is too long and complicated!” “Your decor is awful!” It is so easy to know better when one is sitting at home watching it unfold on television. To actually be there, to walk in their shoes is another thing all together. When I watch these programs now (yes, I am still addicted to food-related television), I have a completely different perspective. I see that exhausted, slightly despairing look in the eye of an overwhelmed restaurant owner and I am filled with empathy. I have likely felt exactly as they do. Owning a restaurant is hard work. You have to love it or you’d run screaming from the building as if it were on fire. It is long days, long hours and regardless of how (fortunately) busy one’s restaurant might get, there is still very little money in the venture. Instead of answering to a boss, I now answer to hundreds, if not thousands of bosses – my customers. They are the reason we are still here after a year. They will be the deciding factor in whether we are here a year from now. When I first opened, I served tables, I washed dishes, I worked grill and fryer, I took reservations and I poured drinks. There were nights when it was only myself and the Chef running the whole restaurant. As hard as it was to play all these roles in the beginning, I am glad that I did; it gave me a clear understanding of what these jobs require and how it feels to have to do them day in and day out. Within the first month after we opened, we actually had two nights for which not a single customer walked through the door. Both were Sundays (we are no longer open on Sundays) and both were blustery, snowy nights. Both times I really felt like throwing in the towel. I recall the first Thursday we were open. I had high hopes that Thursday would be a busy night, but by about 6:45 pm, not single customer had entered. I was the only one in the front of house that night and I had Chef and a cook (who is no longer with us) in the back. The three of us sat at the bar, dejected, wondering where all the customers were. I read to them from David Chang’s Momofuku cookbook about how when he first opened, no customers came through his door. Then magically at 7pm, it seemed like the entire neighborhood showed up. I was alone on the floor, dropping cutlery, forgetting to fill water glasses; from my point of view, it was a complete fiasco. But the customers started to talk: the food was good, they liked the space—it was cozy. The music wasn’t too loud and the chairs were comfortable. And despite my clumsy first forays into front-of-house service, many came back after that first busy Thursday. The first three or four months also presented endless challenges staffing my restaurant. I couldn’t seem to lure cooks out to our neighborhood – everyone wanted to work on the Ossington strip it seemed. I personally ended up working in the kitchen a lot in those early days out of pure necessity. Likewise, to find front-of-house staff that could really hold up the standard for which I was striving proved very difficult. I worked as a server on the floor almost every night for six months. As we started to get a name for ourselves, we were able to attract more talent and eventually we ended up with the solid, skilled and hard-working team we have now. I have a front of house manager who has mercifully (and skillfully) taken endless problems off my shoulders and easily exceeds my expectations for service standards. With the freedom of movement I have afforded him, my chef has been quietly mastering his art and successfully delivering a menu that is so much more than I could have hoped for. In fact, now with my current staff compliment, I am able to spend much more time with my family—I used to see my kids one day out of every seven back in the beginning —it was terrible. These days, I even have the time to do trivial things like scribble a few words in this blog. There are lots of other pitfalls and mildly insane incidents that happened in those first few months. For example, two days before our first fully-booked Valentine’s tasting menu, our sous cook disappeared without a trace and our walk-in refrigerator died. We pulled through it all spectacularly with some last minute luck. Then there was the fact that we got nailed with an ice storm barely after a month in business – the entire neighborhood showed up just to get warm and power up the cell phones. Suppliers had not gotten through the storm, and several staff were stuck so we had to improvise a smaller, easier to prepare menu, but it all worked out somehow. There were nights when Chef had to sleep on my floor because we had so much prep to do the next day. In fact there were nights that we simply never left the restaurant. We napped on the church pews. There was another time an irate customer stormed into the kitchen to confront Chef and I about his main course for which he felt he had waited too long (we were actually pacing it because his wife had not finished her appetizer), nevertheless, we sorted it all out with them in the end. Let’s just say we can laugh about it now. Then came the press and the reviews, and the big one: a perfect four stars. It was a game changer to say the least. Our usual Tuesday nights of 10 customers turned into two full turns of the room with our small staff barely keeping up. Eventually we hired more help and the madness settled into the steady pace we are enjoying today. Our menu has changed so many times in the last year that I have lost count. A customer once said that our menu may look small, but it is actually incredibly large: however you only get to see one page per night. I think that sums it up nicely. Our menu is living thing that will change and grow as we do and it will faithfully follow seasons as I always wanted it to. In fact, when I think about it, despite all the challenges, the adversity, the broken equipment, AWOL staff, long hours and sleepless night, the Beech Tree one year later looks very much like what I had in mind when I first dreamed it up. From the first enthusiastic words typed out in my food blog in 2009, to a folding table at a food market in 2011 to the brick and mortar realization, The Beech Tree has proven to be the ultimate mid-life crisis project. It has been one heck of a year. What the next year brings is anyone’s guess.